Startups face many challenges. Here are some tips to help you avoid the common pitfalls of starting a company. Customers are the lifeblood of any business. Serve your customers, and the rest will fall into line easily. Your cash is running out. Your competition is getting stronger. Your customers are growing impatient. There is only one way to handle these problems … get to market quickly. Far too often we want to dominate the world. Better to focus on dominating main street first. Don’t worry – the world will be waiting for you to take it over. Being a perfectionist is fine, unless it gets in the way of getting your product / service to market. Is your product or service not ready for market. Sell something else! Nothing motivates a team (and investors) like a steady stream of revenues. Labor and rent are two of the largest expenses your startup will face. Conserve your cash by using flex teams. Properly managed, contractors can serve a specific need, then be transitioned out until their skills are needed again, saving you labor costs. This method reduces the amount of space you’ll need, and your rental costs. Make It Easy For Them !!! I recently saw this ad for Yoplaits “Save Lids to Save Lives” Campaign. 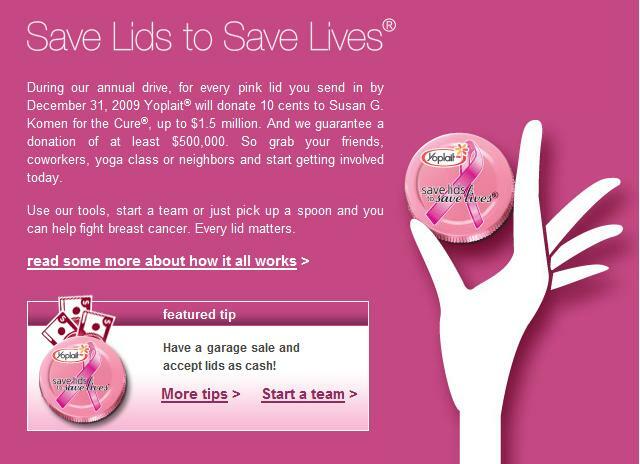 A throwback to the box-top drives of the 70’s, Yoplait donates 10 cents for every pink lid you mail in by December 31st. The key to developing a successful campaign is to make it easy for the end user. It you make them jump through too many hoops, well … they won’t. People are creatures of habit. We don’t like to be pushed outside of our comfort zones, especially by marketers. As marketers, we need to align our campaigns with the behaviors of our target market. Think incremental tweeks that deliver the desired results, not full blown changes in behavior. Purchase Yoplait. Not just any Yoplait, the one with the pink lid. The value of my time and the Yoplait aside, wouldn’t it be cheaper for me to just donate $0.49 (the estimated cost of the envelope and the stamp) to the Susan G. Komen Foundation ? A better idea would be to just print a unique code on the inside top of ALL Yoplait lids (why limit it to just the pink ones? ), and allow me to enter that code in the Yoplait website. Yoplait could then provide me with tools that would allow me to support the cause in other ways (aside from purchasing Yoplait). Just off the top of my head, they could offer social networking tools, email templates, fund raising kits, awareness literature, etc. All the while delivering targeted advertising for Yoplait. That would be much easier than the campaign they’ve launched, not to mention much more likely to succeed. One quick note – let me say that I like the creativity of the featured tips of this campaign. Yoplait is doing the thinking – giving the reader ideas on how they can easily contribute, and achieve the goal. The easier the action, the more likely it is that they’ll do it! Some of you may have seen the article I wrote about Zappos for VegasChatter.com . Having been a key member of many a tech company, I recognize these 10 core values as crucial to launching and sustaining any company. They address the “deal killers” that bring down even the strongest of companies. To be successful, you must focus on the customer. Deliver service beyond the customer’s expectations. You must also recognize that change is good. Be prepared for, embrace, and do your part to create it. Keep an open mind to new things, and explore them. Bad ideas are only the precursor to good ones. Do more with less. I really can’t put this any better. Be faster and more efficient than your competitors. And most important, be humble. The humble person is always striving for to improve themselves. The egomaniac thinks they’ve already reached the top. I even like the name. “Core Values”. When I hear that, I think simplicity. I think basic. I think that above all else, these are the things that we hold true. If you happen to find yourself in Las Vegas, I highly recommend that you take a tour of Zappos. These tours are offered Monday through Thursday three times a day, and are free. Zappos will even come pick you up at your hotel. You may not find everything that they do at Zappos applicable to your company, but you’ll surely walk away with something that will make your team better, stronger, and more competitive – and maybe happier too. Even with all of the social networking marketing tools and strategies that are available to you, it isn’t easy to generate buzz. Ironically, the increased adoption of social marketing tools such as Twitter, Facebook, MySpace, etc. have arguably created more noise, and made it more difficult for you to stand out from the crowd. There is certainly no “silver bullet” when it comes to buzz creation. Those that consistently generate buzz – that generate enormous traffic and position themselves centrally in relevant topics – use countless marketing strategies and tools. One of them is the controversial post. As you can see, the post is controverisal. 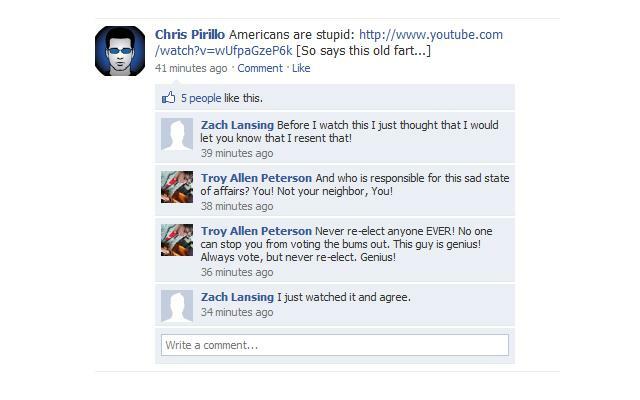 It is polarizing. It is a challenge. And, intelligently design to deflect criticism towards the original author with the disclaimer that reads : “So says this old …” . It also effectively teases the reader into digging deeper. Even if you don’t agree with the original statement, if you’re anything like me your at least a little bit curious about the post. What does the original author really say? I want to know more – even moreso that someone who might agree with the statement. Creating buzz through controversial content is a great way to keep your brand top of mind. But it must be handled carefully. Otherwise, you could end up alienating the audience you’re looking to engage.